Secondary guns of battleship Andrea Doria. Semincingolato Breda Tipo 61, Italian build model of German SdKfz 8 halftrack. Giovanni Messe, quite possibly the most distinguished Italian Field Marshal. Breda Dovunque 90/53, truck mounted gun. Last edited by Carius on 05 May 2006, 23:45, edited 1 time in total. Carcano 1891 and its variants were standart issue rifles of the Italian Army from 1891 to 1945. Interestingly, Lee Harvey Oswald used Carcano carbine to assassinate American President Kennedy. 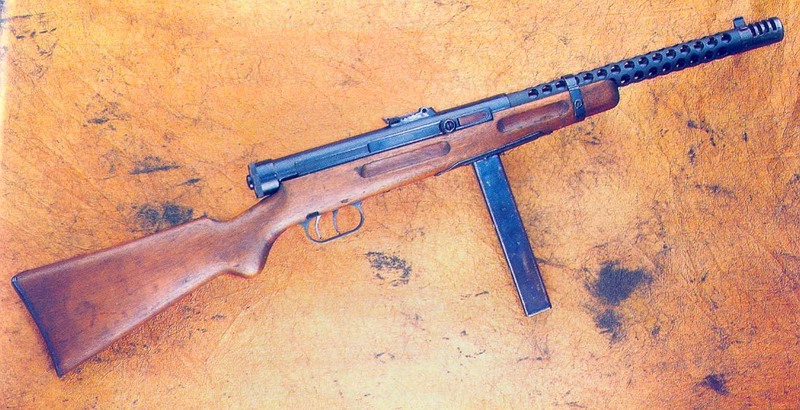 MAB 38, standart issue submachine gun with its variants. Also used by Argentina, Germany and Romania. Stayed in Italian use till' 1975, when the production was stopped. Model 1938A, the most common variant during the war. The body count is a lot closer when you factor in the Commonwealth nations. As far as weapons and such, it is a pitty about the P40 tank. IIRC, only 21 were finished and none used by Italy, even the Republic of Salo. The Germans put them to use, at Anzio I believe. The ethiopians was not poorly armed. Radical changes were done in their army because they were losing hold of Eritrea. But Italy was way better armed. Mussolini spent more time planning on how to crush P.C.I than on war tactics. Germany called for Italy when they were needed and told them were to attack. Since the germans liked to do everything by there own Italy got a little more passive role. Afraid? I don't think so. Italian troops parading in Croatia after the Axis victory in Yugoslavia. Yeah, great fighters those Italians. and took whole family to concetration camp, where my mom's grandpa died of beating. And you better be sure that they did. I somewhat doubt the reliability of the stories of our certain members. Last edited by Carius on 09 Jun 2006, 13:29, edited 5 times in total. Italians are known to be good cooks and poets, lovers (maybe), but for sure they are not good wariors. Especially not at sea, as I know. With all these battleships and subs they could not keep Yugoslav side of Adriatic under their control. They had big problems with "partisan navy" consisted of few machine-gun armed wooden ships. Finally, in 1942 they ran away to their Mammas. They were strong only against unarmed poor civilians, as in Africa so as in Dalmatia! they are not good wariors. It were Italians who created one of the largest empire world has ever seen, and you generalizing. Last edited by Carius on 11 May 2006, 20:36, edited 2 times in total. It were Italians who created one of the largest empire world has ever seen. Italians are not Romans, if you wish to go there. Italians are a Graeco-Latino(Roman)-Etrusco-Germano-etc. people. Last edited by Carius on 11 May 2006, 20:36, edited 1 time in total. I am not going to start a debate about Romans in this thread. It's like saying that ancient Britons have nothing to do with modern British. Last edited by Carius on 11 May 2006, 21:16, edited 1 time in total. It's like saying that , ancient Britons have nothing to do with modern British. No but their the ancestor's of modern Britian along with the Norse and the Viking's. The ancient Britons are among many ancestors of the modern British people, but they have little to do with modern Brits; modern Brits are largely Normans and their civilization and cultural tradition is tied mostly to the Normans, just as modern Italians are direct descendants of Ostrogoths mostly, but might have a tiny bit of Roman in them. might have a tiny bit of Roman in them. I disagree, but you are free to have that opinion. I'm a far descendent of Normans in south italy. Please,when we talk about people, don't generalize. X Drug Tito : my grandfather was Titoist and for this reason was expelled from PCI communist party of italy. No socialism in a country is possible, WORKERS FROM ALL THE WORLD UNITE AGAINST CAPITALISM!! Capitalism is international and our fight HAVE BE internationalist!! Regarding Italian submarines: the 32 Italian submarines that operated in the Atlantic sank 600000 tons of ships, with an average of about 17750 tons of shipping each, a slightly better average than the German boats operating in the Atlantic. The best Italian submarine of WWII was the Da Vinci which sank 120250 tons - more than the best American submarine (the Flasher with 100230 tons) and more than the best British submarine (the Upholder with 97720 tons). 1) No, the most largest empire is America. And they are military better than the Romans were. 2) Italians don't exists. Italy is made by different type of ethnical minorities, united only by a language. 3) Romans steal their knowledge, like every Empire, from different local realities they conquered. Actually the Mongols had the largest empire as far as land goes.Most of the land the Romans had were the areas around the mediterranean.